Tens of millions of us are tuning into college basketball this March and seeing something we haven’t seen in ages. College hoops has admittedly been sub-par lately. Gone are the legendary teams that we reminisce about fondly. Quick! Who won last year’s championship? Did you have to look it up? Here’s a fun fact: Villanova has won two of the last three championships. Can you name a single player off those teams? If you’re not from Philadelphia or an avid college basketball geek (a dying breed), I bet those titles just passed you by. But I bet you know who Zion Williamson is. 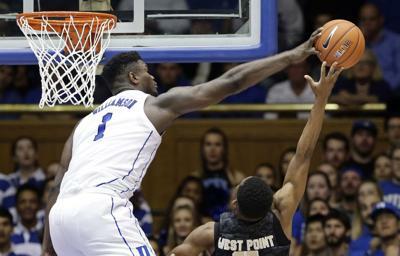 The bestial and celestial Zion Williamson has drawn comparisons from LeBron James to Larry Johnson and while those may be a bit premature, the fact that he’s even being mentioned in the same breath means that where there’s smoke, there’s an engaging and lucrative fire. College basketball purists lament never having seen LeBron James play college basketball for back in 2003, when he jumped from high school to the pros, there was no rule stating kids had to play college ball before declaring eligible for the NBA Draft. Those talented enough (and many who weren’t) had the option of jumping straight to the NBA. A number of players who did so, i.e., Kevin Garnett, Kobe Bryant, Tracy McGrady ended up in the Hall of Fame but we never saw what those guys could do for the college of their choice. We are now getting that chance. 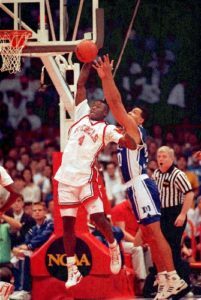 The most hyped college basketball teams that I can remember were the great Duke teams of Christian Laettner, Grant Hill and Bobby Hurley, the Michigan Fab Five teams of Webber, Rose, Howard, King and Jackson and the UNLV teams of Johnson, Augmon and Hunt. Even the Florida Gators teams that won back-to-back championships didn’t draw as much media attention as those previous three. 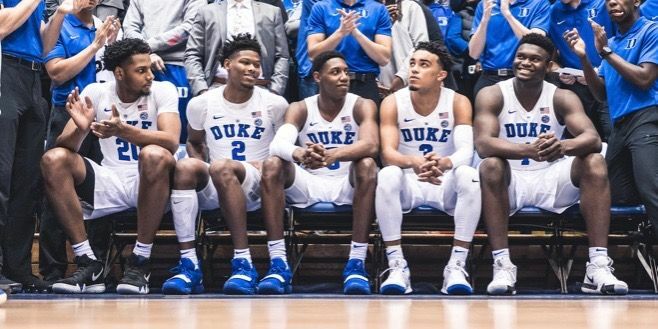 This 2018-9 Duke team is setting a new bar for hype. I can’t help but wonder if it’s because we miss those great teams so much that we have anointed them the next big thing… and in many ways, deservedly so. Zion Williamson, RJ Barrett and Cam Reddish are rumored to be drafted one, two and three by numerous NBA mock draft experts. Never before has that happened. Those Florida teams had their best three players go in the top ten. Kentucky had four players go in the top 13 in 2015 and had both John Wall and DeMarcus Cousins went in the top five in 2010. This is different. None of those players changed the state of the teams who drafted them. In fact, since LeBron James was drafted in 2003, only one player, Kyrie Irving (2011) has been instrumental in bringing the team who drafted him a title… and he did so with LeBron James. Now, to be fair, suggesting that Zion Williamson will bring the team who drafts him a title borders on ludicrous but one thing he will do is sell tickets. His is the most NBA-ready body we’ve seen in well over a decade. Come June, the bouncing NBA draft ping pong balls are going to have a lot of people biting their fingernails in anticipation. You may like Duke. Odds are you hate them. Many have already anointed them national champions. A one-point win over a pesky and well-coached UCF team may have changed a few minds. But one thing is for certain: you’re watching them and that’s more than can be said about college basketball in ages. With the NBA’s celebration of riches, we are rarely witness to this sort of this thing anymore which is why, for better or for worse, we are celebrating this Duke team. As one who likes to see greatness, I forgive the incessant hype machine and am fully on board with it. In a year characterized by parity and a slew of teams, i.e., Tennessee, Gonzaga, Virginia, Kansas and Michigan all holding the number one ranking, the Blue Devils are considered more talented than all of them, at least on paper. The question remains whether they can fulfill their destiny. In a tournament where legacies are self-made, the legend of this Duke team will be decided within the next few weeks. Living up to the hype will be no easy task as this team will get everyone’s best, case in point Aubrey Dawkins. They can either enter the pantheon of great all-time teams – or at least all the great one-and-done teams – or forever be remembered as a team that couldn’t fit the bill. If nothing else, for all the aforementioned reasons, they are the most polarizing college basketball team in ages. We will soon see if they are champions. The choice is theirs to see whether the talent can match the hype. All I know for sure is I’ll be watching intently and that’s more than I can say about the sport in years. This entry was posted in Featured, Hardwood and tagged Cam Reddish, College Basketball, Duke Blue Devils, Fab Five, Florida Gators, Larry Johnson, LeBron James, March Madness, RJ Barrett, UNLV, Villanova by Chris Humpherys. Bookmark the permalink. They (Duke) were luck to get by UCF . That they were, Al, but they did. Here’s the thing tho. That UCF team had a 7’6″ kid who is tough for anyone to play against. They were also coached by one of Coach K’s favorite kids, Johnny Dawkins, who helped build that program, and Dawkins’ kid who played absolutely lights out (and probably bumped himself up the NBA draft board as well). Duke is gonna get everyone’s best shot this tourney as UCF showed ’em. Call me crazy but I’m still taking Duke over the field. Good luck. This team underachieves. K doesn’t know how to coach them. He sold out to one and dones and lives (thrives during the reg season), but mostly dies in the tournament, by them. If they meet UNC In the final that will be epic. Like I said, underachieving (as a number 1) with all that talent, is a knock on K as much as the team. Granted`, I’m a Heels fan, but with that comes the extra scrutiny we tend to observe Duke teams with. Ahhhh, I was waiting for Billy B to chime in on this one. The most-watched finals to this day remains that Bird-Magic final game. Can you believe that? After all these years? I wonder how close a Duke-UNC final game would come to matching those ratings. Safe to say this team underachieved, Greg. I felt Coach K got thoroughly out-coached by Izzo in that loss to Michigan State. He might want to teach his young point guard the value of a successful entry pass for clearly, the kid has yet to learn that.